Joe Croteau - I have been guiding in Estes Park since 1996. During the off season I am a High School Social Studies teacher who graduated from Colorado State University. When I am not in the classroom I am off fishing some of the best holes in Colorado, Montana or Idaho. My summer home is Rocky Mountain National Park and I know it as well as anyone. Hop on a trip and learn some of the secrets the Rockies has to offer! Conor Brown - I started working for Sasquatch in 2007 while working on my teaching degree at the University of North Texas. Now I spend my winters in the Ozarks, teaching 9th grade in Fayetteville, Arkansas until it's time to head back up to Estes Park for another summer of Sasquatching. Ali Bair - I came to Sasquatch six years ago for a fun summer job during college, and have found myself coming back every year since. The fishing, hiking, community, and, of course, the mountains of Estes Park make spending summer anywhere else unthinkable. Over the years, I have fallen in love with guiding. Sharing the coveted craft of fly fishing with so many different types of people has deepened my own love and dedication for the sport. In the off-season, I work as a freelance filmmaker and aspire towards a career in documentary film. I hope to one day produce documentaries about fly fishing culture all over the world, perhaps starting with Colorado. Sam Rubaker - I am originally from Western Pennsylvania and currently studying Biomedical and Mechanical Engineering at Gannon University in Erie, PA. This is my second summer guiding for Sasquatch, and I had the best summer ever last year. I learned more about fly-fishing than I even knew I could and hopefully and I can share with you the knowledge I gained. I grew up fishing in PA with my dad, who is big into fly fishing and who got me hooked. My favorite activity in the world is fly fishing for native trout in reclusive mountain streams – whether it be in PA or CO. I am very excited to be back with Sasquatch this summer and look forward to getting you on some fish! Jason Rieke - I grew up in Rochester, Minnesota and found a love for fly fishing during my time in college. In May 2018 I graduated from college and a week later I hit the road for Colorado where I have lived ever since. 2018 was my “Trout Bum” breakout year. Between guiding and fishing I put in over 220 days on the water. I can’t wait to do it again in 2019! This will be my second summer with Sasquatch and I am super excited to share my love for fly fishing and spending time in the mountains with you! Jessica O'Sullivan - I was born and raised in Northern California at the base of a mountain. I grew up in the outdoors hiking and snowboarding whenever I could. Being an outdoors person I look forward to finding new adventures all the time. I am currently going to college in Northern California, working on general education and discovering exactly where my future will take me. This will be my second summer at Sasquatch and I can't wait to get there and get started again! Ben West - This is my second year guiding at Sasquatch. I grew up in the near town of Red Feather Lakes, Colorado and now study Computer Science and Environmental Studies at Saint John's University in Minnesota. My grandpa was the first to put a fly rod in my hand about 6 years ago and I haven't looked back since. Exploring the beautiful fisheries of Northern Colorado has set me up for a lifetime of chasing trout. Can't wait to see you on the water! Tight lines! Jessica McKay - I was born and raised in Northern Minnesota. I’ve always been a traveler and outdoor enthusiast. My traveling has taken me backpacking the mountain of Montana, surfing the waves of California, climbing the rocks and exploring the canyons of Utah and NOW fishing the rivers of Colorado. I graduated in December from Winona State University as a Registered Nurse. Looking for some fun and adventure, I landed myself at Sasquatch and am looking forward to an unforgettable summer! Nate Stone - I was born and raised just outside of Saint Paul, MN and this will be my first year working for Sasquatch fly fishing! I am a Biology and Environmental studies double Major at Saint John’s university and absolutely love the outdoors. My father was the first one to introduce me to the sport of fly-fishing when I was 9 and now I’m lucky enough to land a job doing it! Looking forward to great fishing and memories with you, cheers! Josh Garner - I am from the great state of Nebraska and have always been an outdoorsy person by growing up on a farm. Currently, I am a senior Fisheries and Wildlife Biology at the University of Nebraska-Lincoln as my plan is to become a fisheries biologist someday in the future. I developed a passion for fly fishing several years ago when I first got introduced to the sport. Over time, fly fishing has given me the opportunity to travel and catch fish in seven different states. I help instruct several fly fishing courses at my university as well as classes at nearby fly shops and tackle stores. Simply put, I love helping people learn the sport of fly fishing! This will be my first summer with Sasquatch Fly Fishing and I am excited to meet clients and help them “catch” some great fishing memories! Kristian Koenig - I come from the suburbs of Chicago in IL and last summer I started developing my love for fly fishing with some guides from Sasquatch. This past December I graduated from Winona State University with a degree in Secondary Math Education and Spanish. This Spring I served as a math teacher in Whitehall, WI and hope to land another teaching position for the 2019-2020 school year. Along with fly fishing I love spending my time outdoors rock climbing, hiking, backpacking, camping, and mountain biking. Sharing my passions with others is something I really enjoy doing and will continue to do through my first full year with Sasquatch. I can’t wait to help you create unforgettable memories in the Rockies and catch some beautiful fish! Bob Barnett - I have been captivated by fly fishing since I was a teenager. I first learned about Sasquatch Fly Fishing while on a vacation to Estes Park with my family. For over 10 years I have developed many relationships with the guides of Sasquatch and am very excited to now be part of the Sasquatch team! I am a co-founder of Project Healing Water Fly Fishing in Kansas City and it is my honor and privilege to teach disabled veterans what I know about fly fishing. I look forward to doing the same with guests this summer! Tom Warmath - I have spent my entire working career in the energy industry. Currently work as a consultant to the energy industry with a focus on energy operation risk management and energy commodity trading risk management. Started fly fishing with my father and grandfather when I was 5 years old. Have fished in the Rocky Mountain Nat’l Park and the surrounding area for 30 years and have just barely scratched the surface of possible fishing spots! There is so much fun fishing here not to mention the great views and wildlife…so come fish with us. There are still so many spots (both new and old) to scout and fish so lets get going! Another great Sasquatch summer…yes!! Eddy Wittry - ​Even though I have been fly fishing the west for nearly 40 years, the lure of Rocky Mountain National Park’s elegant Brook Trout draws me in close every summer. My desire to put clients on fish rivals my love of the dry fly on a one weight rod. If you’ve ever wanted to spend the day with someone who loves sharing passion for this precious resource, on a dry fly, tell Sasquatch and we’ll spend the day watching eager fish hit your fly! It will be tough to know who loves it more — you or me? ​Sophie Bibbey - Growing up on a farm just outside of the Rocky Mountains in Fort Collins, CO I have always had a passion for the outdoors. I had the opportunity to work for Sasquatch over the summer of 2015, and am thrilled to be back! I am currently a sophomore at Arizona State University studying Nonprofit Leadership and Management, and can't wait to spend my summer in the most beautiful place in the world! Growing up on a farm just outside of the Rocky Mountains in Fort Collins, CO I have always had a passion for the outdoors. I had the opportunity to work for Sasquatch over the summer of 2015, and am thrilled to be back! I am currently a sophomore at Arizona State University studying Nonprofit Leadership and Management, and can't wait to spend my summer in the most beautiful place in the world! 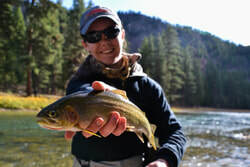 Katie Burgert - I was born and raised fishing in the rivers of Pennsylvania, but fell in love with the mountains during my first trip to Colorado. I love fly fishing and the beautiful places it takes me, as well as sharing that passion with others. I can't wait for another great summer at Sasquatch!